A valid question is how much better is today's equipment in comparison to equipment from a few years ago? Equipment companies are always promising more distance e.g. 17 more yards and release new drivers every year or every second year. I used a Titleist 905S for a number of years. It was launched in 2004 and I used it until 2008 when I changed to a Titleist 909D3. 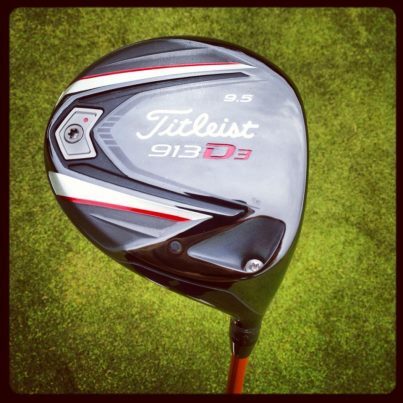 I am now currently playing with a Titleist 913D3 launched in 2012. How much different is the 913D3 in comparison to the 905S? Recently I compared both using a Trackman Launch Monitor. I hit 30 drives with each club. The ball that was used was the Titleist Pro V1. It was a nice September's day, temperatures around 16 degrees Celsius and a slight breeze (around 7mph) against. The results are interesting. Carry and total distance are down due to the wind being against. There was only 0.8 yards extra distance with the latest 913D3 model, but was much more accurate, an average of 15 feet closer. Most interesting is the extra club head speed with the 913 doesn't transfer to much more distance than the 905. There is 2.3 mph club head speed on average which should lead to around 5-6 more yards but only gives 0.8. Also would expect the extra club head speed to give more ball speed but it only gives 1.8 mph extra ball speed. A reason behind the increased club head speed of the 913 might be the longer shaft 45 inches as opposed to 44 inches, 1 mph might be expected increase in speed, also the 913 is lighter 325.2 grams compared to 331 grams this 2% decrease in weight might allow the 913 to be swung faster. A reason behind the little difference in distance might be the shorter shaft of the 905 leading to a better strike giving more distance, it might also be expected to get more accuracy with the shorter shaft but not on this occasion. A reason behind this might be the stiffer flex in the shaft of the 905 leading to shots leaking further to the right. Also the launch angle on the 905 is better than the 913 leading to a more optimal flight and longer distance from the lesser speed. There wasn't a great difference between the two drivers. It could be suggested that as there is a limit on the COR (coefficient of restitution) or springlike effect on drivers that most clubs manufactured since the limit was introduced are near this limit and are very similar in performance. If you have a driver that fits your game well, gives you a centered strike along with optimal launch conditions it's very unlikely that there's a new driver out there that will give you significantly more distance. The key is to have a driver fitted to your game. In this example the 913 could gain more distance with better launch conditions. The 905 could gain more distance with a longer shaft or a slight decrease in club weight.